Tildom had some good reviews on urbanspoon particularly for offering authentic Thai food. From the outside the restaurant is fairly nondescript, with an all glass street frontage and only some small signage. 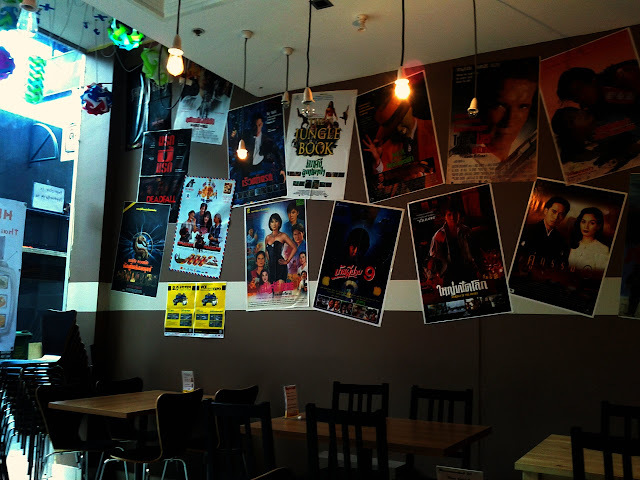 Inside the rectangular space featured one wall covered in a mix of Thai and western film posters, another displaying dozens of Thai number plates, otherwise the décor was clean and modern with wooden tanles and chairs. 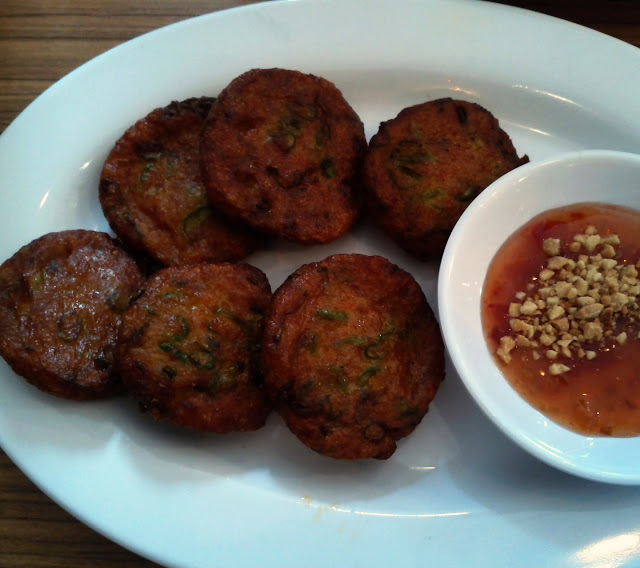 We perused the menu, and decided to share some fish cakes as an entrée, unfortunately they ended up arriving just after our mains. They seemed however to have just come out of the pan, almost too hot to eat. Combined with the dipping sauce the spice factor was up there too, and a good start to the meal. 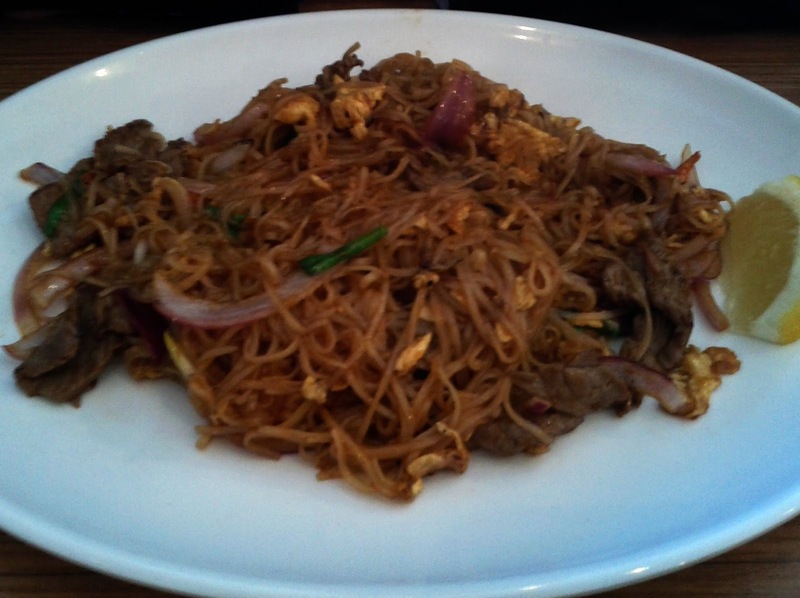 Phil had the Pad Thai beef, which looked a little different to the 'typical' dish I've seen in Bangkok, Melbourne or London, it was also missing the usual peanuts. It was fine without being outstanding. 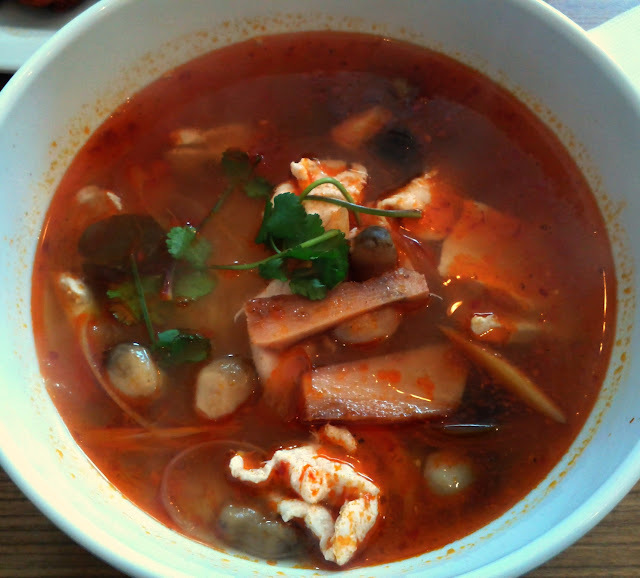 I had the Tom Yum noodle soup with chicken, which was reasonable without the usual intensity of flavour and spiciness. The gangal/ginger and lemon grass were present as were the straw mushroomsbut the punch was lacking. Apart from all the dishes arriving together the service was fine. We were there for the last day of an opening lunch special featuring $9 mains and the overall bill came to a reasonable $23. I'm glad we opted for the the fish cakes as they turned out to be a highlight. Just a quick correction, in pad Thai there is peanut which was stir fired together with the noodles itself, in order to give the crunch to it but the one that sprinkle either on top or on the side is for presentation. It is sadden that you have such experience as you discribe but please do give us another try especially dinner, I can assure you that you WILL certainly have a completely difference experience.